Militant Islamists are targeting Bangladesh's democracy, writes FDD's Maneeza Hossain in today's National Review Online, and the stakes are high: "If Bangladesh becomes a failed state, it would be the first instance ever of a democracy being defeated by radical Islamism." For more on the danger and what can be done about it, read her article here. Bangladesh is a country with the world's fourth largest Muslim population: almost 144 million in 2005. Bangladesh experienced much early turbulence after its founding in 1971, including military coups, but more recently has had a solid record of democratic elections. Bangladeshi migrants in both the Middle East and the West have become well established communities with economic importance for their host countries as well as their homeland. So far, they have not been vulnerable to radical Islamist recruitment, but there are indications that many who have retuned to Bangladesh after working as migrant laborers in Saudi Arabia and elsewhere in the Middle East have been inculcated with a more radical version of Islam that makes them more open to terrorist recruitment. Read more. For more information on Bangladesh see here and here. It seems to me that al Qaeda infiltration into Bangladesh only can be sucessful by consensus of the citizens of Bangladesh and the region. I do agree that the world cannot ignore this problem. But, it should be the regional powers that should make an effort to combat the problem. My question is, Why isn't their any outrage expressed by Japan, South Korea, Indonesia, China, India, or the influential Muslim nations in the region? They are the ones that have a better grasp of the behind the scenes of what is happening there. Also, they are the ones that can have a better chance of connecting to the citizens of Bangladesh since they are all Asians. Why is it when their is trouble in the world, there is a an outright demand that the west, particularly the US, should get involve. In my opinion, it is western intervention, especially the US, that add growth to terrorism. The only helpful thing that the west can do is to open their markets to free trade and offer moral support. Islamic terrorism in Bangladesh is a muslim problem that should be dealt with by the government & citzens of Bangladesh, by other Muslim countries, and the Asian powers in the region. Western or US intervention will only exacerbate the problem. Whether terrorism is a “Muslim problem” or not, the world is engaged in a global war against terrorism. Therefore, I would strongly advise against isolating the issue region by region. International cooperation is the only way we will defeat radical Islamism, and countries as large as Bangladesh (population wise) which go unnoticed by the media, have become hide-outs. Last week an estimated 300 bombs went off in less than an hour in an Islamic country the size of Wisconsin, but with a population of 150 million. Although the attacks in Bangladesh were apparently not specifically targeted to kill civilians this time, two people died and more than 120 were injured. A banned Islamist group, the Jamatul Mujahideen, claimed credit for the attacks. Their message was clear: they just wanted to let the nation know that their terrorist network has been established. Read More. 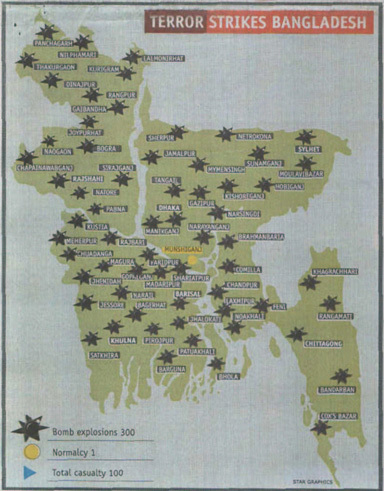 FDD obtained a scanned copy of the leaflet that the Jamatul Mujahideen left behind at the site of one of 200 bombings that they orchestrated last week in Bangladesh. A translation into English is available here. Anyone who still needs to be convinced that the war against terrorism is about democracy and freedom should read how the Jamatul Mujahideed themselves define their jihad: " In a Muslim country there can be no laws other than the laws of Allah. But it is a matter of great regret that in a land inhabited by 90 percent Muslims the laws of Allah are not enforced in Bangladesh. On top of it from the districts to the capital city in the courts of law justice is dispensed according to laws based on a man-made constitution." In other words, their battle is to destroy Bangladesh's democracy and replace it with Islamic theocracy: "Jamatul Mujahideen discards the existing judicial system of the country and they stand for the demand for upholding Allah’s laws and faith in Allah. At the same time it rejects the constitution that conflicts with Allah’s laws and calls upon all to abandon the so-called election process and run the affairs of state according to the laws of Allah and the traditions of the prophet." And who are their enemies? "The laws of the land are the brain-children of infidels, non-believers and Jews precisely to destroy Muslim mores and faith." ELEANA GORDON: Is Bangladesh becoming the next al-Qaeda haven? Time for the world to pay attention. Two days ago, Bangladesh was blanketed with a series of synchronized bomb explosions. Not 2, not 20, but more than 200 bombs exploded in less than an hour, throughout a country the size of Wisconsin. The local newspaper, the Daily Star, published a map of the bombings that conveys what words cannot. The bombs exploded in 62 of Bangladesh's 64 districts. Although they were not intended to kill civilians (not this time), 2 people were killed and more than 120 injured. A banned Islamist group, Jamatul Mujahideen took credit for the attacks. Their message was clear: they left behind their business card, letting the nation know that their network is in place and what they are capable of in their goal to take over Bangladesh. A leaflet found at one of the bombing sites said: "It is the third call to establish Islamic rule in the country. If ignored and (if) our people are arrested or persecuted, Jaamat-ul-Mujahideen (Assembly of Holy Warriors) will take the counter action." The group was referring to prior attacks this year for which it had claimed responsibility. Why have we not seen this map in major Western newspapers? The Washington Post carried a small item about the bombings on August 18, on page A-13, and the New York Times buried the story in the International Section.